If you’ve had an iPad for at least a couple of years now, you’ve probably noticed one of the major ergonomic issues with it: there’s no perfect way to hold it. You can hold your iPad to use it which always feels just slightly awkward, place it on a table which hunches you over and strains the back of your neck, or put it on your lap and fold your legs up which just feels ridiculous. A Kickstarter project called the Tstand aims to solve this problem. The Tstand is a new, adjustable tablet stand that can dramatically decrease muscle tension when you’re trying to do something as simple as watch a show on Netflix. The stand has a foldable, clamshell design that can match any viewing angle you need. If you rest the stand on your stomach while you lay in bed, you can watch a show without having to lift your head or keep your arms up. 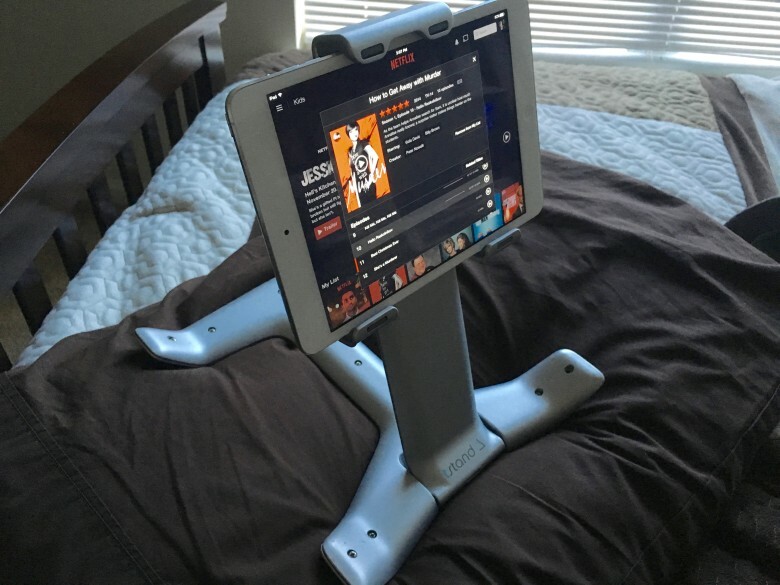 You can also position the stand so that your iPad elevates right next you on the bed while you lay on your side. Swivel the bottom half of the stand behind the tablet and you can set it up to act as a computer monitor on your desk. Just slide a keyboard underneath and reach up to touch the screen as necessary. The stand will perfectly position the tablet at eye level so you don’t have to slouch over. I was sent a pre-production model to test out how well the Tstand works and I have to say, I’m totally impressed. I didn’t realize how often I do put strain on the back of my neck when I use my iPad. It’s my computing device of choice when I’m leaving my home, yet it often winds up on the table with my Smart Cover folded up for a slight angle. Still, the angle requires me to put my head down and stare uncomfortably. My favorite use case for the Tstand is easily in bed. While I imagine someone out there will probably take advantage of the Tstand for naughty purposes here, I quite enjoyed watching an entire episode of How to Get Away with Murder on it, which by the way is a fantastic show. I didn’t need to prop up my pillows or hold my iPad up. I just angled the Tstand so the iPad was aimed right at my face while still remaining comfortably distant. 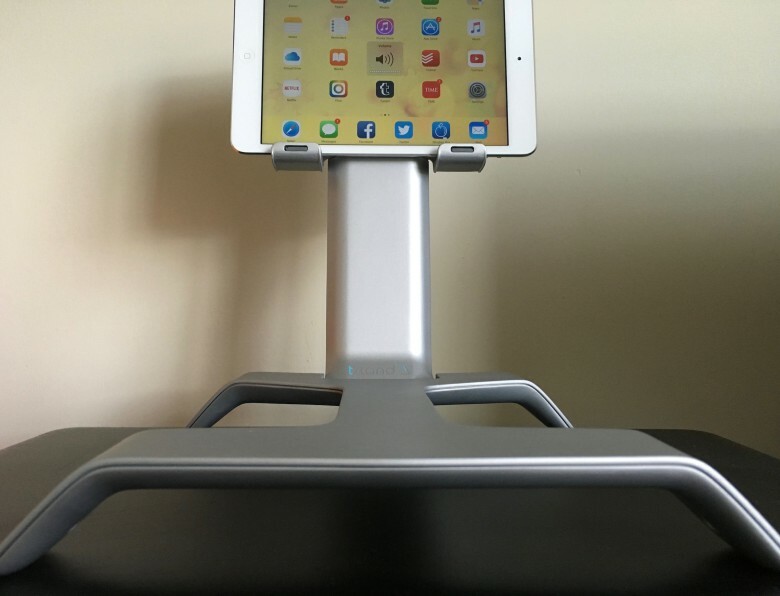 I enjoyed using it at eye level on my desk for a bit too, and also found it makes a great tripod to film with the iPad or FaceTime while sitting. 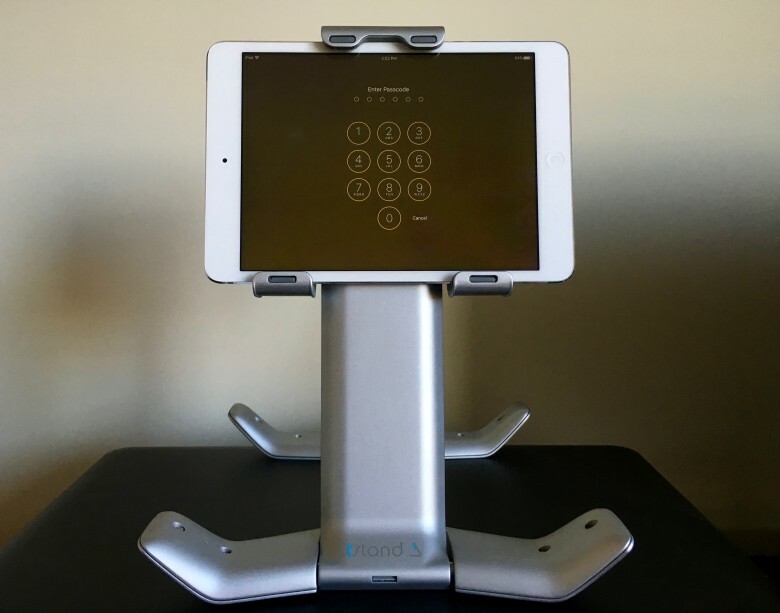 If you don’t have an iPad, the Tstand adjusts for any tablet as small as seven inches and as big as 13 inches, so that includes the new iPad Pro and Microsoft Surface Pro 4 too. I did find that the build quality of the Tstand could be a bit better. It’s not bad, but getting my iPad mini in and out of the holder made me nervous that it would snap somehow. The mechanism for adjusting the angle isn’t as buttery smooth as I would prefer either. Still, I loved spending time with it. In many ways, the Tstand feels like the missing piece between a tablet and the way we all try to interact with one. It also does wonders for my neck. With just a little over a week left in the Kickstarter campaign, you can head over there to fund the project for as little as $37.